Our understanding of Mexican food has evolved far beyond Tex-Mex fajita meal kits and nachos in recent years. It’s one of just a few cuisines in the world to be granted Intangible Heritage of Humanity status by UNESCO, absolutely bursting with colour, flavour, heat and texture – and because it’s so well-suited to big feasts, it’s perfect for when you have dinner guests over. Our collection of Mexican recipes contains a vibrant mix of authentic Mexican dishes. 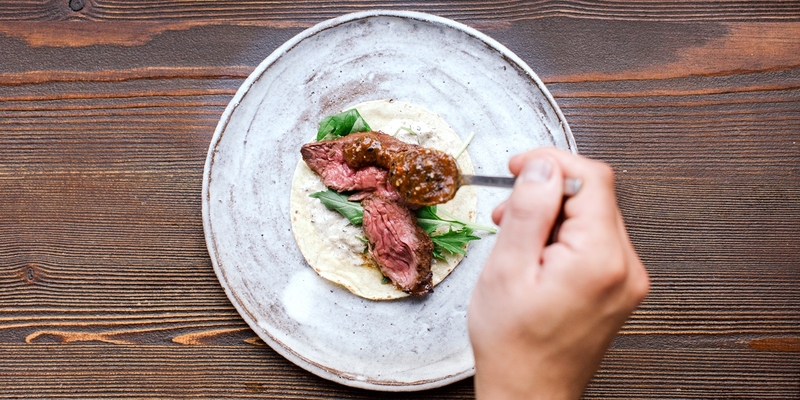 Tacos are undeniably the poster boy of the cuisine, and Nud Dudhia’s Beef short rib tacos with black beans and chipotle jus are a fantastic example of this. Salsas are an important cornerstone too, allowing diners to customise their tacos with different flavours – whip up a batch of Burnt morita chilli and sesame seed salsa, Tomatillo salsa or Burnt spring onion crema for a triple-threat of taste. Cook a fantastically complex stew with this Mole coloradito sauce, or give duck the Mexican treatment with Thomasina Miers’ Duck legs with Veracruzan tomato sauce. For something really hearty and rarely seen in the UK, there’s Picadillo – perfect for stuffing into tortillas – or Albóndigas Mexicanas meatballs. Whatever you decide to cook, remember that Mexican food is all about customisation, so get your creative juices flowing and whip up a veritable feast!